I really messed up. I don't know exactly what I did, but it fits completely different than the other skirt. It does fit, though, so that's good. Actually, I really like that it's more fitted, so you could say that it doesn't matter, but I'm still curious what I did wrong! The fabric is from an estate sale. I don't even know what type it is, but it really had a lot of body, which I liked. I added a stripe of twill tape to the bottom, which probably emphasized the uneven hem, but oh well. 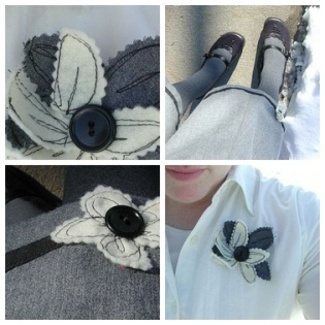 Some freehand machine sewing on cream felt made the little flower that I stitched on. I made a brooch to match. I like how it turned out. I even got new shoes to go with - I needed them anyway - and chose the cute over the more-comfortable. **Oh, and I know I didn't give you a very good full shot of the skirt - I felt kind of stupid asking someone to do it for me so I just took these myself. Maybe next time I wear it? It's made of 8 panels, though, and it flares at the bottom. **Speaking of church clothes.... Princess woke up this morning, brushed teeth, brushed her hair and put a clip in it by herself, and got herself dressed - without being asked. That's pretty cool, and she was so proud of herself - but what she was wearing...! 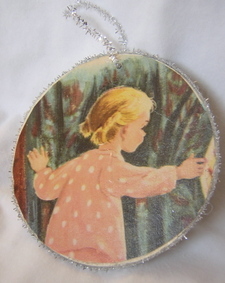 She had on a swedish-style black/white sweater with an olive green/gold velvety tiered shirt. I had one of her new outfits all layed out for her, but she wanted to choose her own. If we were staying home I wouldn't care - but I did make her change her shirt for church. Bad Mom Moment? Saw "The Prestige" yesterday - so so good! While I'm late to rave about this movie (it was at the dollar theatre already) I just have to tell you how cool it is. Incredible movie: dark, twisted, exciting, amazing. Would definitely recommend. It so makes you think, but I can't say anything, just in case you haven't seen it (and because I'm still mulling it over). I think I'll read the book. At the theater, I was shocked (stupidly) to see a dad walk in with 2 kids, about ages 4 and 7 (seriously), and leave them sitting about 4 seats away from each other (to save seats while he left to get treats) just in time for a LONG, gory, SCARY preview for the Grudge 2 (which looks dumb, but the preview is effective, I didn't even watch the whole thing). I just kept thinking of the poor kids! Poor scared kids sitting all by themselves. The Prestige was completely inappropriate for that age of kids, too. What were the parents thinking? I've noticed that several theater chains have started posting signs about 'Kids under the age of 6 will not be admitted to R rated films after 7pm'. I'm sorry, but kids under the age of 6 shouldn't be allowed in R rated films, ever! Even if they don't understand the film, they are still exposed to the scary music and feeling (or inappropriate humor, etc.) in the theater. I remember seeing families with young children coming out of the 'Austin Powers 3' theater a couple of years ago and just being blown away. If you went to see 3, then there's a very good chance you've seen 1 and/or 2, and know that while you may enjoy it - it isn't appropriate for children. Seriously, people. It makes me mad. Okay, rant over. Another randomly cool thing is this game I got for Aaron for Christmas. He's proud of me because I looked around, read reviews, and (most helpful) talked to his brother about what to get him. It's called Shadow of the Collosus, for PS2, and it's amazing. It's hard to even describe, but it's cool just to watch. It has seriously cool graphics, music and other features. It's like watching a movie - in fact, while writing this post, I've left to check out what's going on several times. I pass this on to anyone who might want to score some points with their gamer husbands. Now you know. Devil in the White City (link on my sidebar - for now) - is an amazing book. I loved it. Non-fiction, but reads like fiction. I didn't know much about the 1893 Chicago World's Fair before (or our nations first serial killer), but it was incredible and very influential on our culture. When I finished the book, I did a Google Image search for photos of the fair - so so cool. Check it out, it's a worthwhile read. 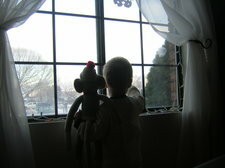 Monkey has named his Archie doll 'Cute'. I love it. He is such a kid for soft toys. Also, Monkey really enjoys Peppermint Patties. I know this because I found him surrounded by a pile of wrappers from them today. He had found/raided our stockings! Seriously, he ate a ton, and cried loud and hard whenwe took the rest away. Stinker. 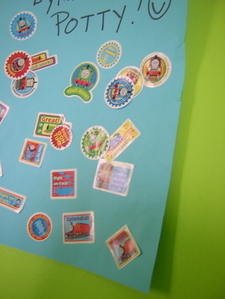 This is the paper that Thomas puts stickers on when he goes potty (usually in our crazy-green bathroom). Do you see how many? (The 'Right On Time' one is especially fitting). We've started a second sheet! Woo hoo! 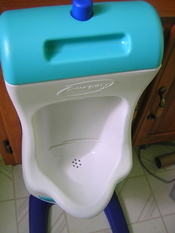 Potty-training ASD kids is different from other kids. I actually went to a seminar to get some pointers (most were from this book). I felt like I needed help, as Princess pretty much potty-trained herself, and Monkey is on the verge of following in her footsteps (really, we were going to try and train both boys at once, but decided it was too much, esp. for Thomas). After 3 days of spending hours in the bathroom with him, moving a space heater and mini tv in their too, he is having a lot of success. Today (drumroll, please) he used the potty twice by himself! Completely, like I didn't see him, went to check on him, and he'd already gone! I can't explain how exciting this is - no wait, I can- imagine changing a 4 yo's diapers - and then not having to anymore! We still have a ways to go (and I don't know how he'll handle church, school, etc) but we've made way more progress over the past week than I ever imagined we could. First and foremost - these are my photos, but my mom's amazing handiwork! 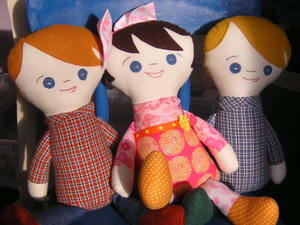 My kiddos were lucky enough to each get a make-along doll for Christmas. A brunette, a redhead, and a blond, just like my kiddos. 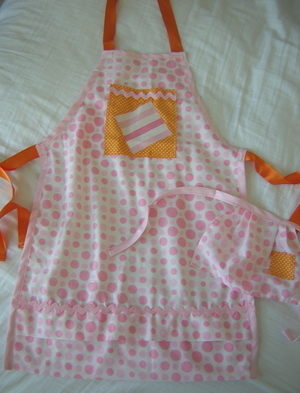 You may recognize the tights/shoes/bow fabric from Princess' apron. Mom came and borrowed some scraps from me. 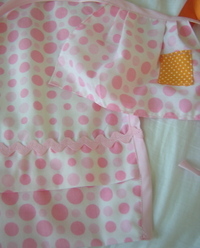 I think she did a great job picking out fabric - she even added a ric rac rosette! And the boys' shirts? 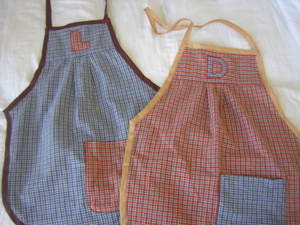 From the same shirts as their aprons, too. No buttons for them - the boys would probably chew them off. Click here to see Thomas' doll in action. My mom actually whipped up another 3 to send off to other friends - see them here. Now my sisters want her to make them dolls that look like them, too! The g is for her name, and for Grandma. We had a lovely Christmas, thank you, I hope you did as well. "If a tree falls, and you don't blog about it, did it really fall?" 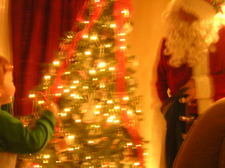 Santa always comes to the homes with small children in our neighborhood on Christmas eve. 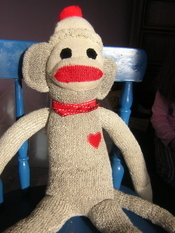 Monkey's favorite present was (appropriately) a sock monkey that my mom made him. 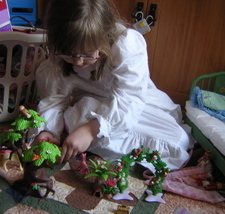 Princess spent the day playing princess Playmobil and putting Violet to bed. I got up at 4:00 am (stupid acid reflux...) and the kids got up at 5. We tried to make them go back to sleep, but at 5:30 gave up. Princess and Thomas grabbed their stockings (end of the bed - worked great) and opened them in our room while Monkey got an extra hour of sleep. Then we woke him up (didn't take much - just a whispered "Let's go open presents!") and headed downstairs. Lucky, lucky me! Such Motivation! Merry Christmas Eve Eve! I remember 'celebrating' this as a kid - and now Princess has figured it out for herself. Yesterday was Merry Christmas Eve Eve Eve! 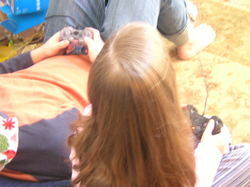 Isn't Christmas so much more fun as a parent? Seriously, Christmas must be really close - as I'm starting to see ads for Valentine's Day! That's just wrong. And Happy Birthday to Parenthacks - a site I enjoy and contribute to. 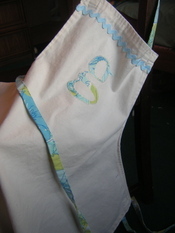 We made little drawstring totes to give them in. I think they turned out so teeny and darling. 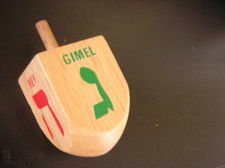 I have only one more ornament to deliver - and several tissue holders. Haven't yet because have been spending a lot of time in the bathroom with Thomas. Potty-training is going better than expected, but not amazing. We'll get there. 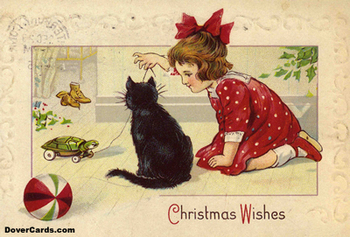 And on that lovely note - Merry Christmas to you! Watch 'White Christmas' all the way through - Max and Ruby and the Grinch have been winning the dvd votes this year (boys!). Listen to as much Christmas music as I possibly can squeeze into the next few days. 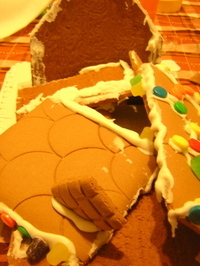 At our house, Gingerbread houses are all about having fun, not aesthetics. Not at all. Everyone participates and all candy gets used. We usually buy kits from Costco. I'm sorry, but for $8.99 I couldn't buy all the candy I needed - let alone the energy to actually bake one and make royal icing. This year there were some ... technical difficulties. While I appreciate that the icing was pre-mixed this year (and, I think, tastier) it didn't seem to dry as fast or hold as well. It was all downhill from there, I'm afraid. Aaron put the front and back pieces together, and cut the sides and roof pieces to fit. 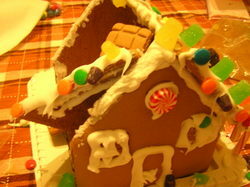 More of a Gingerbread Lean-To. Behold! 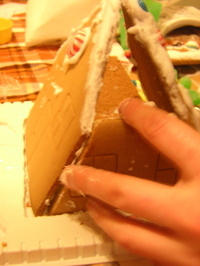 The Little Gingerbread House That Could! I like that it's shaped vaguely like an old-school telephone. There is an art installation in the front yard (in case you couldn't tell). 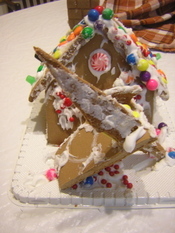 This may be the Best Gingerbread House Ever - because we all laughed so hard while making it. Princess is asking if we can make one just like it next year. For Princess: made from a thrifted pink pillowcase from the stash Eva gave me, with some orange fabric, ric rac, and ribbon from the grab-bag I got at JoAnn's last time I was there. The tuck at the bottom is because the pillowcase was actually a sham. I like it. 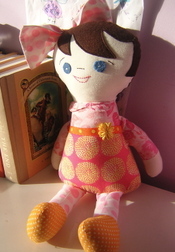 And, of course, I had to make one for her doll, Violet, too. I love how these turned out! For the boys, I used some old shirts that were Aaron's. I just cut a panel from the back of each. I like how it has the little pleat in the front. The cool thing is that all of these were made using things I already had around. Gotta love that! I believe I've mentioned that pretty much our whole street gives a little something to everyone else on the street. That's 12 gifts, right there. Not including other neighbors, friends, etc. 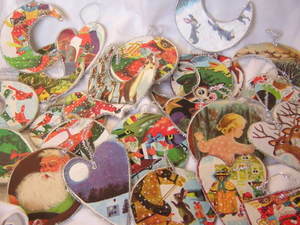 We have made treats in other years, but for the last couple of years have ordered ornaments. This year we I decided to make ornaments. 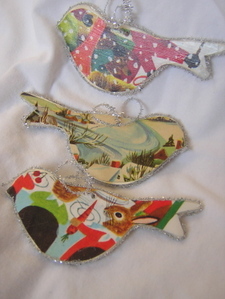 They're wood shapes from a craft store decoupaged with vintage children's Christmas books, tinsel added to the edges, and a hole drilled through. I like how they turned out. A little Meg inspired. Princess picked out the bird shape. I wasn't sure how that would work, but it ended up being my favorite one. You can cut the little strands apart into little strands of tinsel - which ended up being just what my ornaments needed. 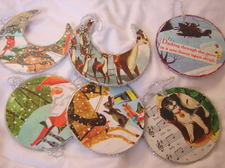 It was a little hard to separate the ornaments - I kept thinking how nice they'd look all on one tree, but alas. Maybe next year I'll make more. 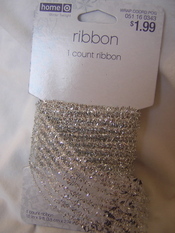 I packaged them simply - small, clear cellophane bags tied with more tinsel. I really like them, I just hope my neighbors do. Thomas, Princess, and I just crunched our way up and down the street in the 6+ inches of snow we've gotten today to deliver them to everyone. Cold, but fun! Thomas said "Merry Christmas!" at every house - good boy.